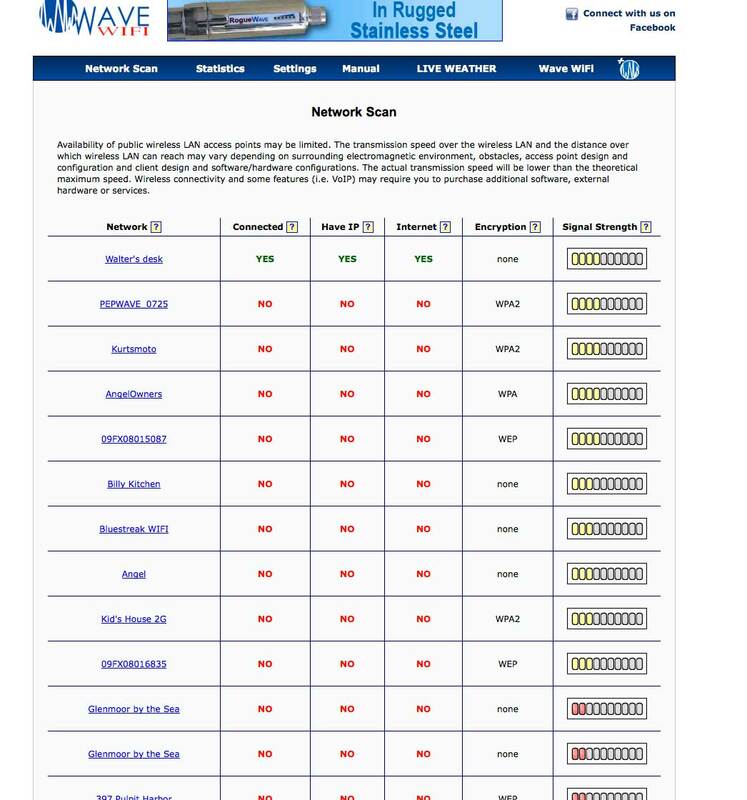 SetSail FPB » Blog Archive » Efficient, Versatile, Easy-To-Use Communications: What Is the Answer For Cruisers? As you can see from the first screen shot, we are connected to both wifi antennae, each on its own signal from a different land based computer, and both cell accounts. 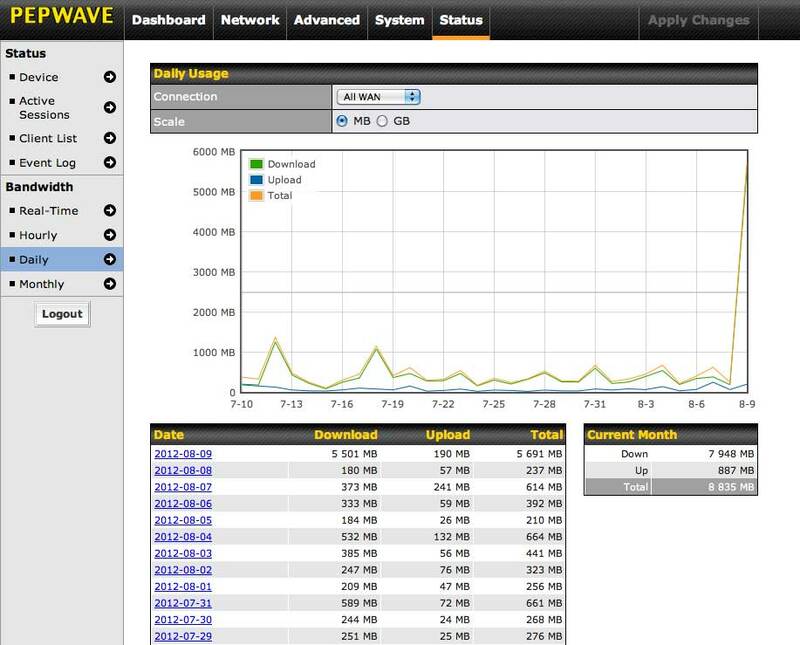 The Pepwave router “pings” all four active sources constantly and selects the fastest. You can keep track of the current data rates on each connection, as shown above. Note that at one time or another each of the four connections is helping out. In the last 24 hours we’ve had several long Skype conference calls with New Zealand, talked to Europe a number of times, and been on the Skype phone with Todd for hours. Then there are family contacts. With several robust wifi connections we’ve been up and downloading a bunch of data at the same time, the record of which you can see above. We’ve mentioned the Rogue Wave wifi antenna, of which there are two, in previous posts. We could do the same job for a fraction of the cost, but their software is so simple and easy to use that it makes the extra price worthwhile. Each antenna has its own internet address, and we simply type that in using the Firefox browser to bring up the page shown above. We select the signal to lock onto, and close the window. We do this twice at each new anchorage, once for each antenna. The second antenna is shown here. The Pepwave router costs around US$1300. The two Rogue Wave antenna add about US$800. The installation is an additional 16 to 24 hours of labor, plus maybe $500 in wire. A substantial package to be sure. But if your ability to cruise and choice of destinations is dependent on being connected, as ours is at present, this seems like a good investment. A final word: once set up this system is basically automatic, and easy to use. You do not have to be a techie to keep it working. If not everyone aboard has computer skills, this ease of use makes the system even more attractive. This entry was posted on Thursday, August 9th, 2012 at 12:48 pm and is filed under Cruiser's Tech Talk. Both comments and pings are currently closed. Seven miles fo r the cell phone towers. As to wifi, maybe few hundred yards/meters to a quarter of a mile, but not really certain of the origin. We have been using the Bullet by Ubiquiti as our wireless bridge, which I believe would be the equivalent to one of your Rogue Wave units. It uses an external antenna, and greatly enhances the number of viable wifi signals we can receive aboard. How important has it been for you, having two of them as opposed to just one? I’m assuming you have not, or not yet, added any kind of cell signal boosting device or antenna? We have never used one, which is why I don’t even know what they are called. But I think you and Pete have both mentioned the possibility of getting one. In the U.S., cell signals are often cast in a wedge shape I have been told, which would explain why we always had bad cell reception while underway even close to shore in the States. Throughout Mexico and Central America, though, that is not the case. Cell signals blast out in all directions, and we have been amazed to get good cell bars sometimes 15-20 miles offshore. So we have been happy to date with the USB cellular broadband devices easily available in these countries. We are curious whether you intend to try boosting your cellular broadband reception somehow, now that you have tried out your system? Years ago, in fact when we first met Todd Rickard, he installed, with caveats, a cell booster. It did not work well, if at all. We asked about this last winter, to see if there might be something that was sure to work, and it not find an answer. Perhaps some of the SetSail visitors will have direct positive experience with cell boosters. We too have used the Ubiquity Bullet, both directional and omnidirectional, along with the Alpha 35 in both modes. These are excellent wifi options, of low cost. But they do require a degree of technical expertise, and manual switching between them and the cell signals for Ethernet. We went with the dual wifi antenna so that we could have two separate signals from which the router can choose. Just a form of insurance. The same with the dual SIM cards for cell. Id we weren’t tied to the business, the reliable comms would be less of an issue. Re cell coverage in the US and elsewhere, we have had much better experience in other countries. Our experience has paralleled yours in this regard. We have the RogueWave WIFI booster for the same reason….the software. What I noted is that the o-ring design on the top connection to the antenna isn’t that good….and leaks. We wrap our units with “Tommy Tape” to seal both the ethernet jack side and the antenna side. Most are only concerned about the bottom seal for some reason. FPB design. 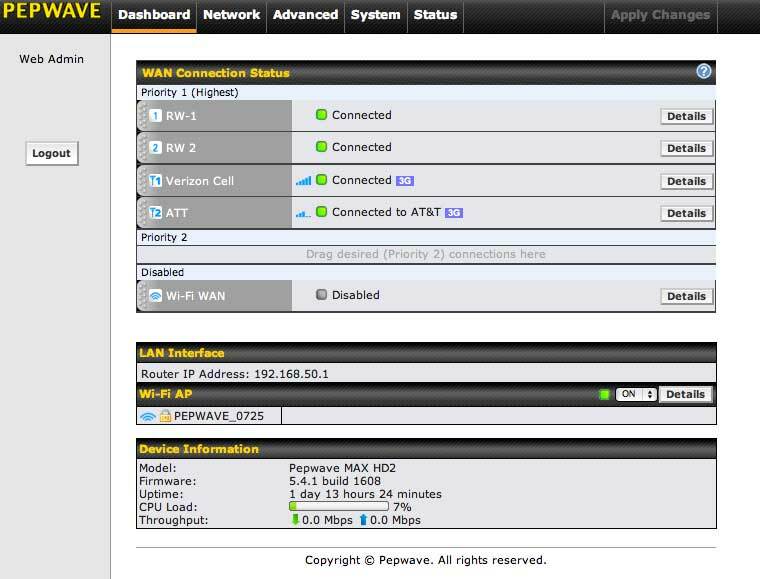 I’m very interested in acquiring a Pepwave Max HD2 router. roughly USD 2300. What am i missing here? 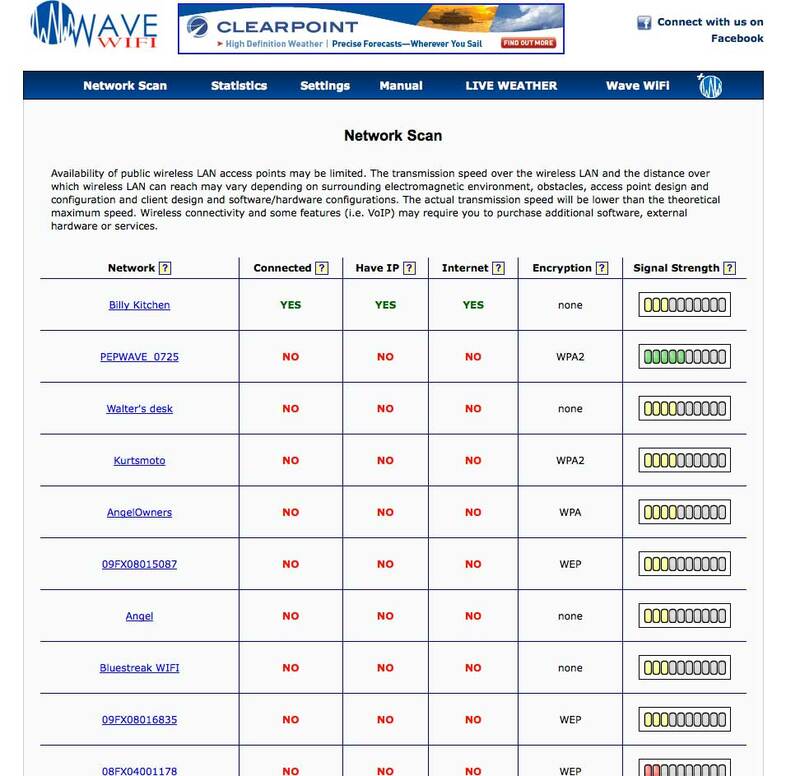 Look for the Pepwave model that does NOT have the ability to bond two signals (for which you need a VPN) as it is the less expensive version.